Before...LOOK at the TINY DOOR! That window is now in the bathroom! The combination of the tiles turned out great! It's still not huge, but it has a great tall utility cabinet next to the vanity for plenty of storage. 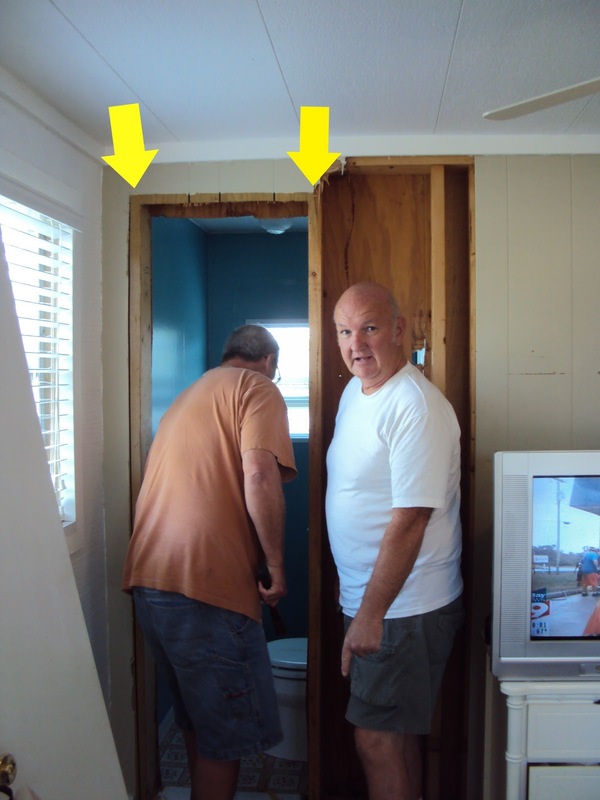 This complete job was done on a BUDGET...even though this is a mobile home...if you would have a contractor do a job turning a 1/2 bath into a full bath...it would be a huge amount of money, probably in the neighborhood of $5,000-$9,000 depending on your choices. I didn't have that kind of money...so this project was done on a budget WAY less than that. In the next few post I will go through some of the ways that I was able to cut chunks out of the cost of the remodel. The project that went on and on and on and on ....and on, is now come to a close! Here are some pictures of what you missed...sorry I was MIA, a little bit of LIFE got it the way! A big mess...but a work'n POTTY! Even the worker bees needed a little break! Well...that is the end of the sneak peek! I will be posting the finished product soon! Happy New Year! This rectangle watery blue glass tile...an accent! Can't wait to see it up! When doing any project there are so many choices to make...and not all of them are *FUN & EXCITING* choices. Usually...I can make decisions quickly and swiftly, but sometimes you just get hung up! I was doing some of those NOT SO FUN things and decided to take a stroll over to the lighting section of LOWE'S. This one I really loved...it was a fabric oval drum shade type of hanging light fixture with the Satin Nickel finish....it was just light and airy. LOVE THAT! This one is looked like sea shells ... and had that bronze or black finish. I had to LOSE my ceiling fan when doing the latest project of expanding the en suite bathroom...so I am on the hunt for a new ceiling fixture option...but it's gonna set me back just a bit on budget, because the location of the lighting has to be moved....I've gotta get creative! The last piece of the puzzle on the outer wall! We have a space issue IE. *It's SMALL*, and can't really do much more about that, but the *POTTY* sticks out a little to far in front of the shower access...so we have scoured the hardware stores for a COMPACT POTTY...but to much dismay, we aren't picking up many INCHES, so what's next you ask??? When your legs can hang down through the floor of the bathroom...not always a good sign...but the scene from the 2009 surgery ended with a *ALL CLEAR* from the Dr...so we are crossing our fingers that this one has the same result! I'll keep you posted on the status and some of the finishing touches that I have picked to finish off this *BUDGET* Tiny Bathroom Redo...stay tuned! Now that the DEMO is done....it's time for some covering back up all the mess and making it pretty again. Oh hurry and get that yucky wallpaper covered back up! and you won't be able to tell it was even repaired! The new wall going up...sacrificing a little space out of the bedroom....but WELL WORTH IT! New wooden look wall going up! This stuff is my NEW FAVORITE PRODUCT! Prepping for the the vanity light. Ended the day with a new door! Stay tuned more to come! take'n a break watching all the action!